Place the chicken in a large pot and cover with cold water. Bring to a boil, then drain and rinse the chicken. Place the chicken in the stockpot again and cover with cold water. Bring it to a second boil, reduce to a simmer. Add the vegetables and herbs. Simmer for 3-4 hours, make sure the chicken is submerged, adding more water if necessary. 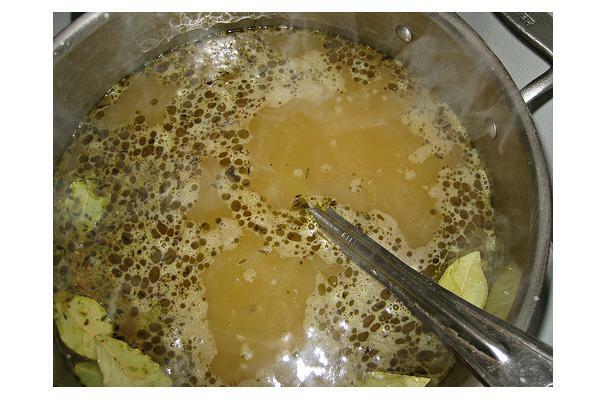 Continue to skim for scum during the simmer, taking care not to disturb the stock too much. Strain stock through a fine mesh strainer. Cool immediately in large cooler of ice or a sink full of ice water to below 40 degrees. Place in refrigerator overnight. Remove solidified fat from surface of liquid and store in container with lid in refrigerator for 2 to 3 days or in freezer for up to 3 months. Here is my simple 3 minute take on chicken stock...no muss...no fuss...great results.